January has been quite the busy month for my crocheted ladies and me, we're all blushing from all this wonderful attention! I am most excited about this lovely two page interview in the February issue of Period Homes & Interiors. A huge thank you to the especially lovely Katherine Sorrell for choosing me and for making my very first 'live-on-the-phone-actually-talking-to-an-interviewer' interview so easy! 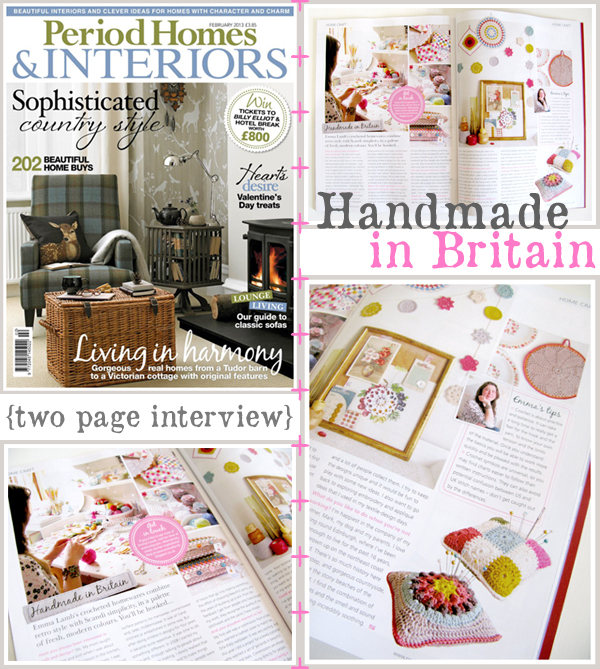 Every month Period Homes & Interiors 'Handmade in Britain' feature talks to an up-and-coming British artisan or crafts person so it's well worth keeping an eye out for. 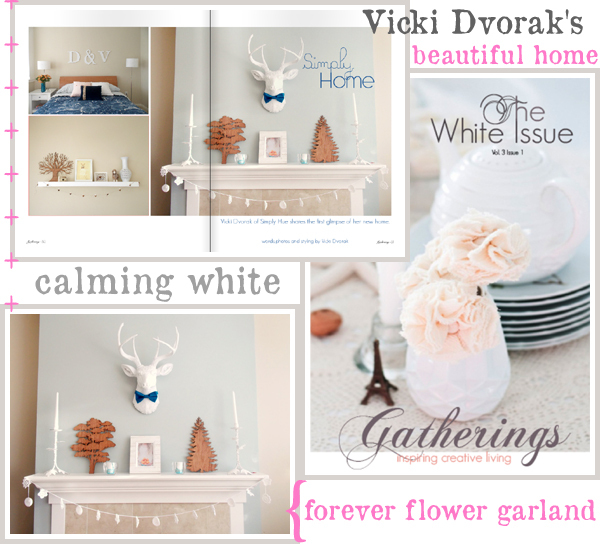 I am sure many of you will have already spotted one of my pure white Nina Forever Flower Garlands in the latest White Issue of Gatherings. She appears in the most beautiful home tour of Vicki Dvorak's soothing condo. Take a peek at the full article from page 50 of the White Issue of hop on over to Vicki's blog, Simply Hue, to see more. 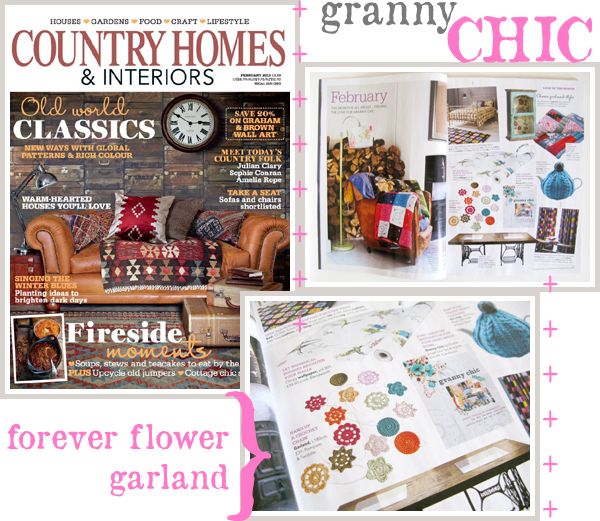 Last but not least, a lovely surprise appearance on another of my Forever Flower Garlands appearing in the February issue of Country Homes and Interiors. Courtesy of Pompom & Twiddle this lovely lady is featured amongst a gorgeous collection of granny chic goodness right next to the fabulous Granny Chic by Dottie Angel and Ted & Agnes. Yay! Oh btw, if you're in the UK and are looking for copies of hard to find magazines (I had trouble finding a copy of Period Homes & Interiors in Edinburgh) the lovely Kathryn, over at Secrets of a Butterfly, suggested this fabulous site where you can easily pick up almost any single issues you are looking for. Thank you lovely Kathryn! Well done to you - well deserved too! I know, it's a fab site, isn't it!? Bravo on all the magazine articles, Emma! I will be on the lookout for these issue at Barnes & Noble's international newsstand aisles over here in NYC. It has been a very busy month so far and I would love for it to continue through the whole of 2013! Emma, this is all wonderful! Such a great start to the new year - not sure how you do it all but keep it up!